One of the great things about PC gaming is the sheer amount of diversity. We're starting to hear rumours about games consoles considering tiered hardware specifications, but such choice has always been available on PC and the divergence extends well beyond performance alone. Pricing can range from under £500 to over £3,000, the list of accessories and peripherals is seemingly endless, and high-end gaming rigs come in all shapes and sizes. 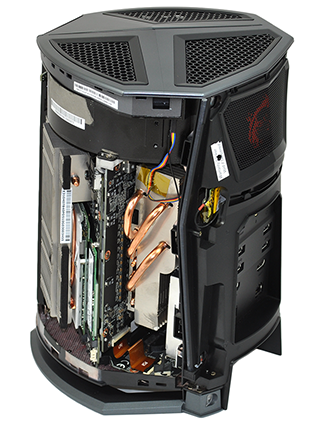 There are obvious benefits to big machines touting lavish cooling, complete flexibility and simple upgrades, yet there's increased demand for small-form-factor solutions. Mini gaming rigs are a better fit for the living room, they bode well for LAN party transportation, and there's something perpetually satisfying about compact machines capable of dishing out full-tower levels of performance. 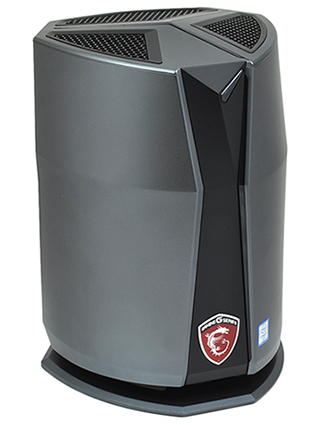 Factors such as heat, noise and price tend to make small-form factor gaming PCs a tough nut to crack, but MSI reckons it has a winner on its hands with the Vortex G65. 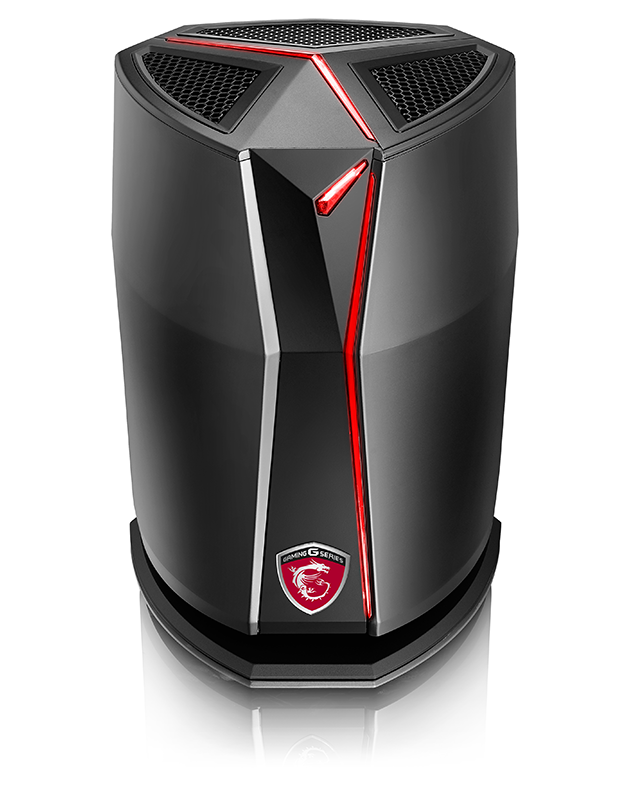 Borrowing design cues from Apple's Mac Pro and applying a gaming twist, MSI's unusual desktop packs an Intel Core i7 processor and dual Nvidia GeForce GTX 980 GPUs into an eye-catching 6.5-litre cylinder. 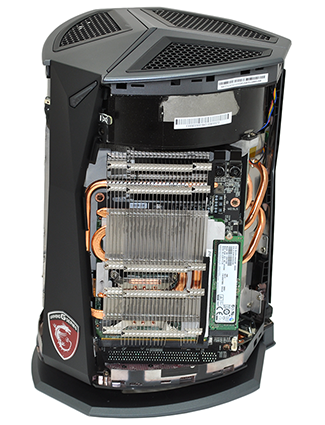 It's a fancy piece of kit, that's for sure, but MSI also appears to have borrowed from Apple's lofty pricing strategy, with the Vortex G65 6QF SLI being introduced to retail at an eye-watering £2,998. That's a serious chunk of change for a base unit, albeit one that's unlike almost any other similarly-equipped Windows machine. Exclusivity, as we know, tends not to come cheap, and the system's allure warrants a closer look. Premium design is mandated at this price point and MSI does well to present a unit that looks the part and feels tightly knitted together. 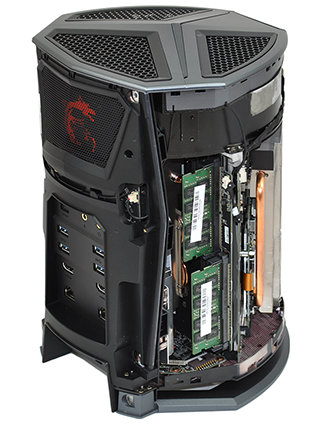 The chassis, constructed from a blend of plastics and metals, is sturdy with no squeaks nor rattles, and for a gaming rig we like the relatively sleek black-and-grey exterior. 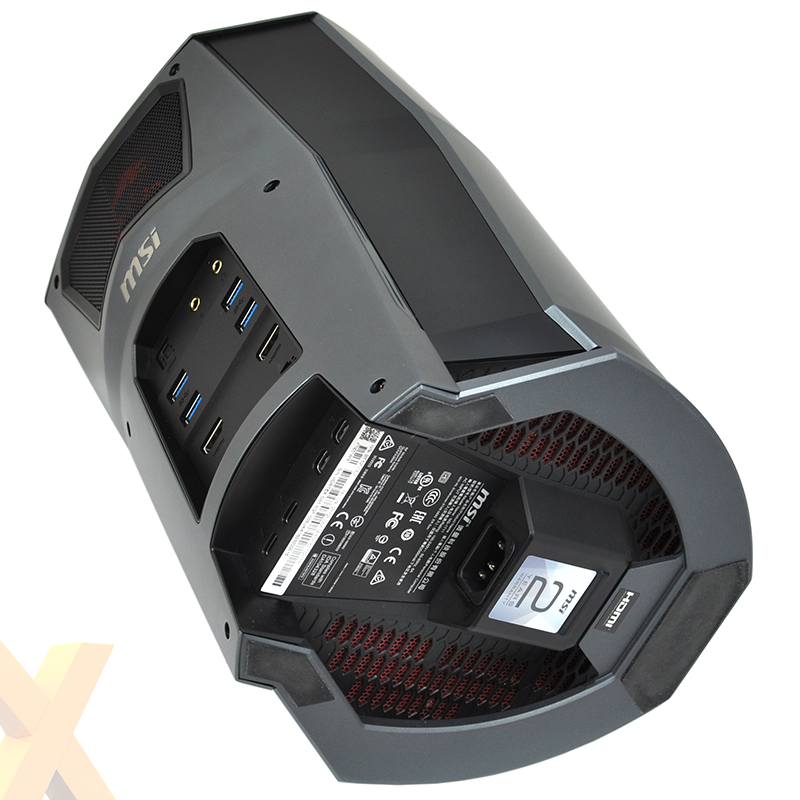 A few angular sections provide just the right amount of edge, though as you might expect MSI hasn't refrained from adding LED illumination. There are strips across the front and top that light up, and both colour and effect can be controlled via a bundled software utility. You can also turn the lights off entirely, should you prefer. A total weight of just over 4kg keeps the unit sat firmly on a desk, and though it does look cool sat alongside your monitor, it won't be long before you begin to lament the lack of forward-facing I/O ports. Instead, MSI's collection of SPDIF, mic-in, headphone-out, four USB 3.0, dual HDMI (v1.4), dual Killer E2400 Gigabit Ethernet, dual mini-DisplayPort and two USB 3.1 Type-C with Thunderbolt are all tucked neatly around back. An impressive collection of ports, though it would have been nice to have had at least one front-facing USB for the sake of convenience. The Vortex G65's appeal lies, in part, with its ability to deliver a prime selection of components in a fun and unique way. 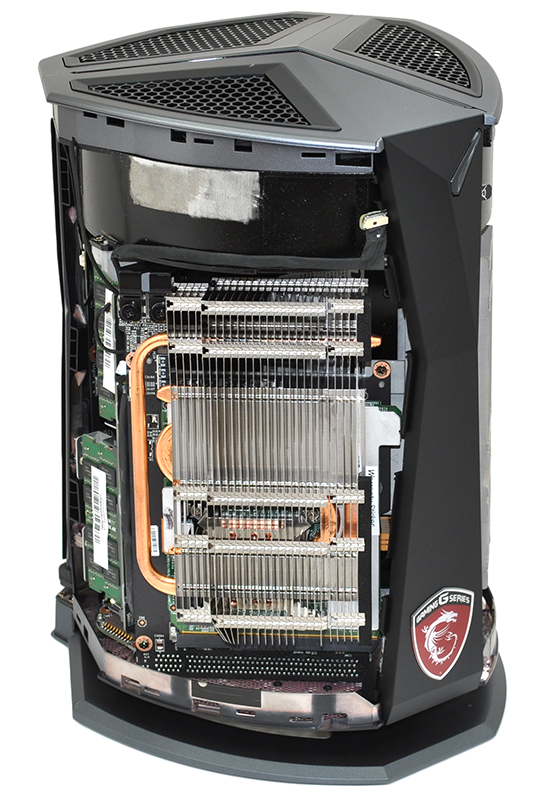 PC enthusiasts could of course build something far more powerful for less money, but that's missing the point, and try as you may, you'd be hard pushed to put together something as intricate as this. 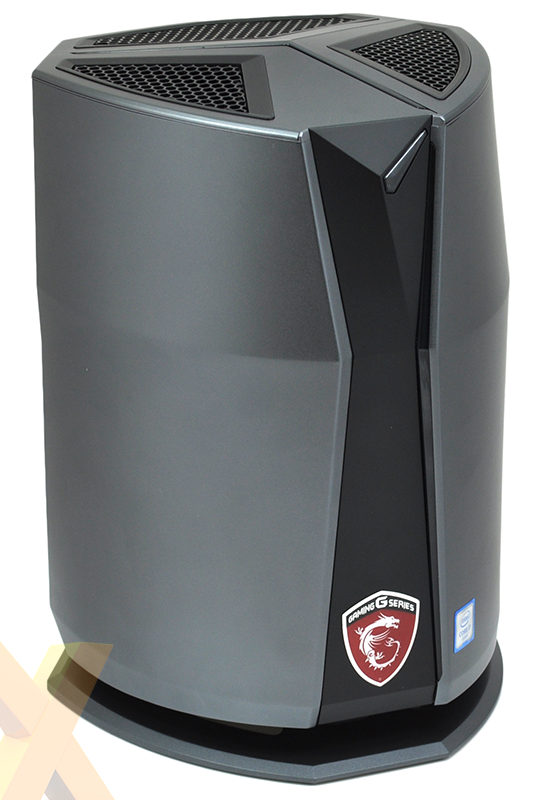 We dread to think what MSI shelled out on tooling alone. So what exactly do we have? On the inside, the Vortex's core components are spread across a trio of PCBs arranged in a triangular prism and connected via a series of ribbons. 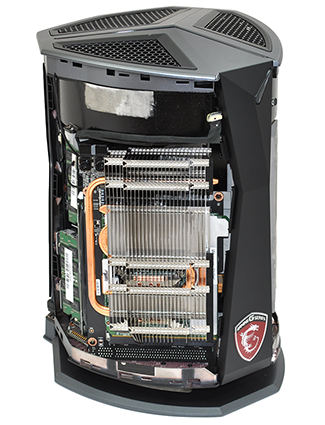 The first PCB, located toward the back of the unit, is in effect the motherboard and houses a desktop Core i7-6700K processor as well as four SO-DIMM DDR4 memory slots. Two of these are outfitted with 8GB, 2,133MHz modules as standard to create 16GB of RAM in a dual-channel configuration. 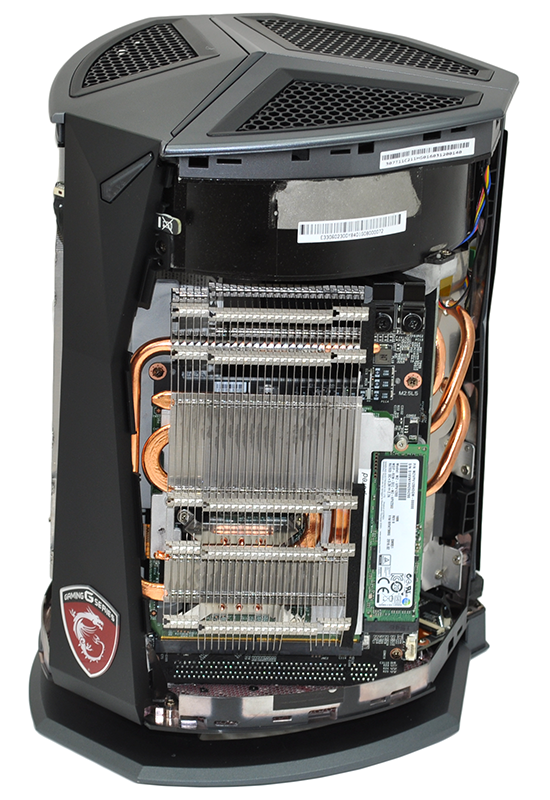 Strapped to the motherboard and completing the prism are another two PCBs each outfitted with a GeForce GTX 980 GPU in an MXM package with 8GB of GDDR5 memory. Note that this is the Nvidia GM204 silicon originally intended for desktop, then tweaked for laptop suitability and now returning to desktop in the Vortex. 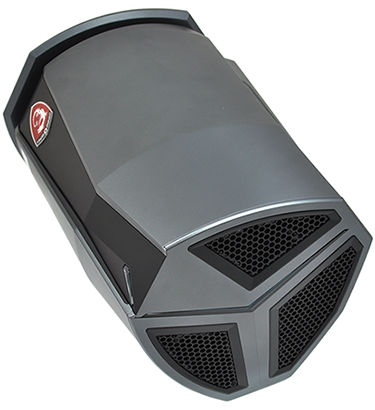 The GPU's 100W power envelope is well suited to what MSI is trying to achieve, and eagle-eyed readers may have noticed that the same SLI configuration has recently been employed by MSI's own GT80S 6QF laptop. Each of these three primary PCBs is lined with a good-sized heatsink to help draw heat away from the underlying processor, yet unlike traditional CPU and GPU coolers there are no attached fans. 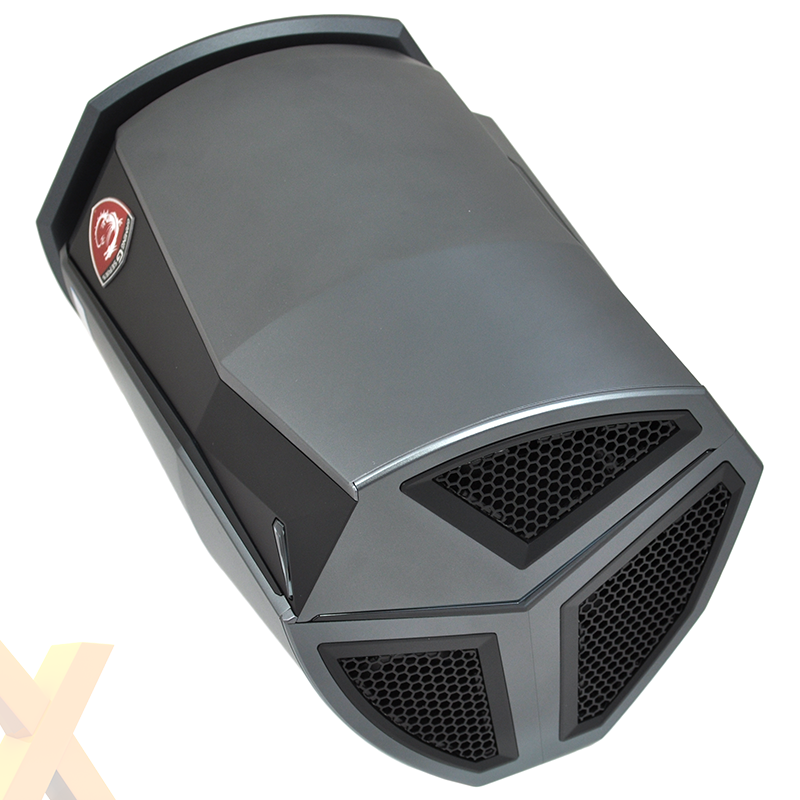 Instead, and much like Apple's Mac Pro, MSI uses a single large fan in the roof of the unit designed to pull air upwards and exhaust heat out of the vents on top. 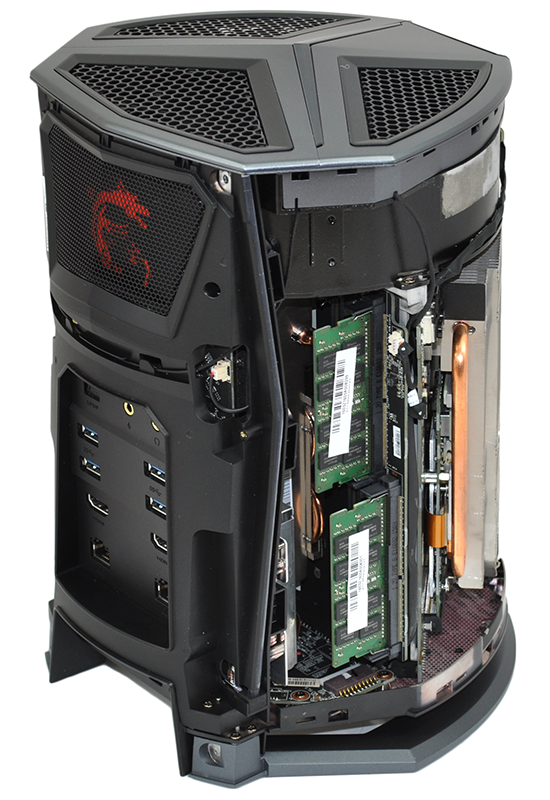 It's a clever arrangement, but where are the other bits you need to create a complete PC? 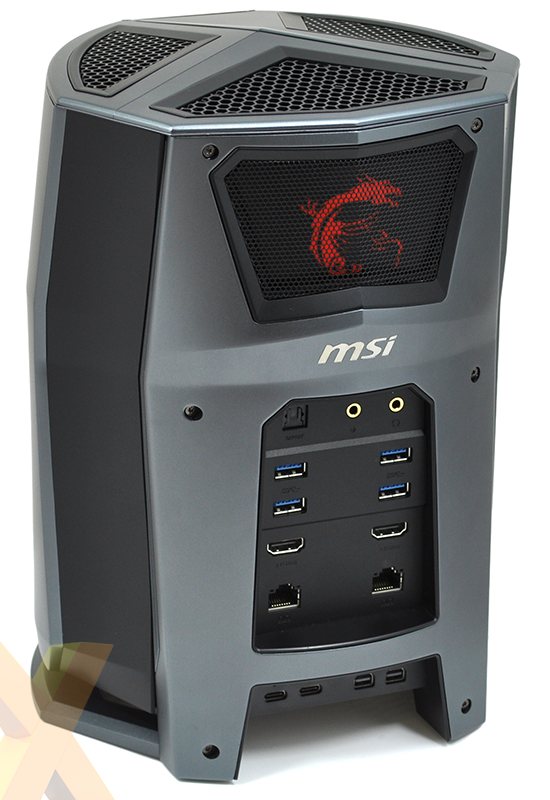 Interestingly, MSI has moved the Z170 southbridge to a fourth PCB sat behind the rear I/O ports. This board handles the bulk of I/O connectivity and also manages to squeeze in a 2.5in drive tray, which MSI fills using a 1TB Hitachi hard disk. This, in our estimation, is one of the Vortex's weaker component choices, as the noise of the mechanical drive is out of touch with the rest of the system. There's more. An SSD is essential in any modern performance PC, and MSI has two M.2 slots attached to one of the graphics PCBs - one on the front of the board, another on the rear. Each of these carries a 128GB Samsung SM951 NVMe PCIe drive and both are paired together in high-performance RAID 0. Surely they can't shoehorn anything else in there? Well, actually, yes they can. There's a Killer Wireless-AC 1535 WiFi module, and seeing as the triangular arrangement of main boards leaves a void in the middle, MSI uses that space to slot in a 450W 80 Plus Gold-rated power supply. That means no external brick, and it's tidy being able to connect the Vortex directly to the mains with a single cable. A fascinating arrangement, however it isn't without limitations and there are some that may deter enthusiasts. Users who favour upgradability, for example, won't like the fact that opening the chassis will void the two-year warranty. Furthermore, anyone who likes to tinker may be disappointed by the basic BIOS - there's no elaborate UEFI on offer here - and if you're pedantic about squeezing maximum performance from your components, you're unlikely to be enamoured by MSI's out-the-box CPU and GPU implementation. Presumably in an effort to contain heat and keep well within the limits of the 450W PSU, the Core i7-6700K is by default limited to 4GHz - 0.2GHz lower than Intel's standard specification. 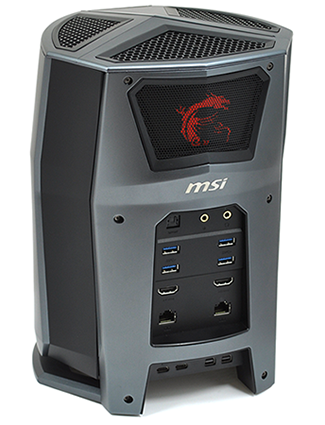 You can manually overclock the chip to 4.6GHz in 0.1GHz increments using MSI's Dragon Center software utility, but that doesn't change the fact that this is a £3,000 gaming PC that's underclocked as standard. Given the system's unorthodox arrangement, MSI also hasn't found a way to have both GTX 980s hooked up via PCIe Gen3 x8 interfaces. When under load, one appears to be operating via PCIe Gen2 x8 2.0, and the other by PCIe Gen2 x8 1.1, so in addition to the vagaries of SLI scaling, users are going to have to accept that Vortex G65 in its current form will not have both GPUs running optimally. 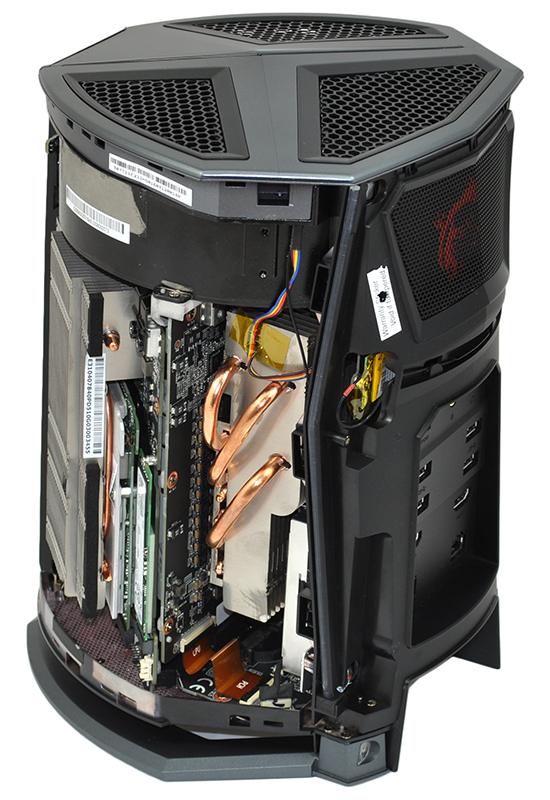 There's definitely room in the market for premium, pint-sized gaming rigs, but such machines need to deliver the complete package and the Vortex G65 doesn't always live up to its £3,000 billing. Little things like unwanted bloatware pre-installed on Windows 10 detract from the package as a whole, and if you're spending this amount of money on a PC, you don't expect to be nagged to register Norton Security, nor do you want to be directed toward a particular web browser. We're still fascinated to see how the system performs, so with all the preamble out of the way, let's get on to the benchmarks and see how fast this cylinder of intrigue really is.